Beth Merriman whips up a unique and romantic product at her Etsy shop, Chicken Scratch. "Massage candles burn like beeswax candles, but you are able to use the melted wax as massage oil. Burn the massage candle for 20 to 30 minutes, then extinguish flame." Merriman said in her shop announcement. "Pour a small amount of melted wax into your palm and apply to sore muscles and dry skin. Perfect for aromatherapy, too." The single 30-something, who works in backstage theatre as a dresser in San Diego, opened her shop in May but started seriously trying to promote her shop in the past month. "Some of my best customers are the actors and crew, who are always looking for opening night presents or something to send home to their loved ones," Merriman said. The name of her shop was the first thing she thought of when a prospective customer asked about her company name. "My grandfather always called my sister and I 'chickie' when we were little; and I needed to make some scratch (cash) quickly. Plus, of course, my candles are made from scratch," she said. "I listed my shop on Etsy the next day." Selling a scented product online is tough, but Merriman has found ways to work around it. "It's so hard! My apartment sometimes smells like I've just baked 12 dozen gingersnaps and my mouth waters," she said. "I try to be as descriptive as possible in the listing. I've also ordered additional supplies to make tealight-sized samples, which I'll send out as a promo with each order." Merriman also is considering putting together a sample pack for a small fee. Customer testimonials are helpful as well. "Wonderful!" said one Etsy buyer. 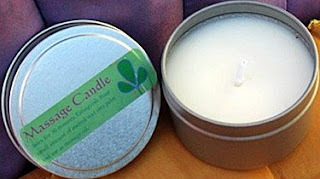 "My candle arrived today and it smells so good! I'm burning it now and can't wait to try out the massage part. Thank you!" Merriman found the original recipe for massage candles online, but found the finished product too greasy. After consulting with her sister, who has studied herbs, Merriman added therapeutic essential oils and tweaked the ingredients. "My candles are vegan, meaning no animal products are used," she said. "The soy wax melts at a lower temperature than beeswax, so it won’t burn you, and the shea butter just melts into your skin." Merriman recommends her candles as gifts for others or for yourself. "And, of course, if your romantic partner needs a hint, you can leave one on their pillow and see what happens next," she said. Merriman is working hard to promote her store, creating accounts on Facebook and Twitter and buying ads with Project Wonderful. "My postcards are up in all the coffeehouses, yarn shops and massage/yoga studios in my neighborhood. I always carry business cards," Merriman said. "I've joined Etsy Team Veg and stay active in the chat rooms and forums." "If someone really wants a dill pickle candle, I can make one, but I'm not obligated to sell 50 of them to cover my costs. It allows me to be flexible and stay creative." Beth- I love your massage candles! I am both a painter (fellow etsian) and a choregorapher. Not only do i need these candles after "dancing" with the canvas, but my dancers do too! I will be placing an order for christmas gifts soon! Thanks for offering such a unique, multi-purpose product and for featuring it in this great blog!